My friend has been wanting one of these for a long time so I purchased it for her for her birthday. She has used it every night and loves the way it makes her skin look. I used to use a pot of boiling water and stick my face above it till I found this.Pretty easy to use, that's why I only gave it a 4 stars.stetting it up is ok.You have to find a place where you can sit comfortably above the steam.Don't sit under a fan or near the AC.You can use with or without a towel around your face.A towel will make the steam hotter.If you can find a comfortable place for it and relax this is a spa quality treatment. You can put essential oils in the water to be steamed and apply masks while your pores are open.I really like mine but I don't pull it out as much as I used to and I should.It's not that much prep and clean up and I did see results. 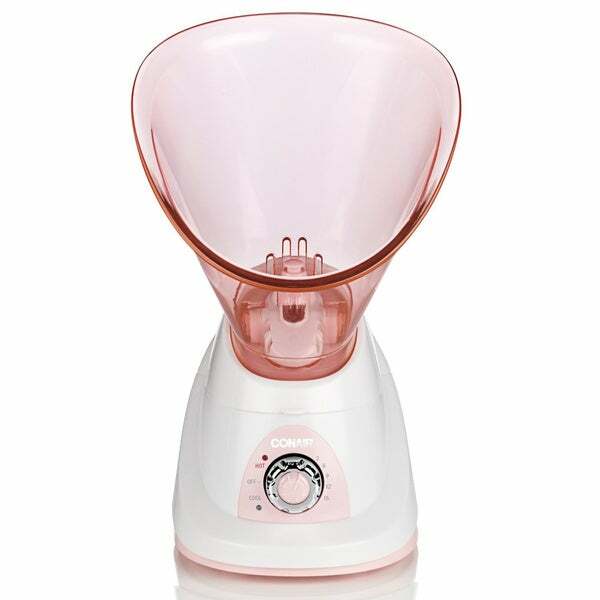 This facial sauna has helped me manage my oily/acne prone skin. Twice a week a use this sauna after cleansing my skin to open my pores before applying a mud mask. The steam from this sauna really opens up my pores to allow my skin care products really do their job. Plus it makes my skin super soft. Have enjoyed this facial sauna very much. Steam makes skin feel very cleansed and supple and cool mist is refreshing. This is a new beauty ritual I will enjoy several times weekly. I absolutely love it! It is simple to use! It works wonderfully, and it is great for your sinuses as well. My face feels great after every use. The warm cycle feels relaxing & clears the skin. Love this product!! Looking to add some more Conair products in the near future. Amazing results on my first time using. I’m so glad I stumbled across this. My skin is plump and very hydrated. A definite must have for your skincare routine. And the price is great. Very lite, almost too lite.easy assemble and take apart.Good steam but I wish it had a deeper fitl for longer steaming.Id do a grade up if I could. Brought it for my granddaughter, buying bnb one for myself. Being using it 2 times a week love it! Works just like you would need it to! It doesn't work as described at all.